Darwin Triathlon Club president Tony Cox and committee would like to thank all our members who have participated at our many events this year; all our wonderful volunteers who have given up their time to help out at our events; our coaches who have assisted members to achieve their goals and our supporters who have contributed to our events … we have had another brilliant year of triathlon in 2014 and now we look forward to some down time before bringing our members more swim, bike, run & fun in 2015. Stay safe out there on the roads if you are riding (or driving), and we look forward to seeing you all again at our first event in the New Year – Race 2 of our Aquathlon Series at Lake Alexander. 1. Order is now open online here for our club tri gear. 2. Our new design club t shirt was a popular request, don’t miss this opportunity to order yours. 3. Details, size chart links etc available at above link. The final junior session for 2014, the Christmas Come and Tri, was held on Sunday at Lake Alexander. The youngsters had an obstacle course, jumping mats, rolling, running and bike skills stations for the start of the morning and then finished off with two triathlon races, BBQ and lolly bags. There were prizes for the best fancy dress and also five lucky name draws won gifts kindly donated by the team at Blue Cycles NT who also helped out on the morning. A huge thank you to Steve Goat (DTC junior coordinator) and all those who assisted on the day. 2. POST your items to buy, swap, sell or simply giveaway to a good home at DARWIN TRI – BUY | SWAP | SELL Facebook page. Request to join and feel free to add your posts & include photos if you wish. If your item sells, please comment sold on your post. 1. For those of you who like to plan ahead, recent announcements that ITU Worlds heads to Mexico in 2016 and Rotterdam in 2017 will be of interest. 2. Congrats to Tom & Louise O’Neil on the arrival of their baby daughter Amelie (3.19kgs & 51cm). All well. 3. Tom & family are off to Newcastle in the new year and wanted to say thanks for the last few years of racing in Darwin. Tom says, “We have had some great fun and met some lovely people during our time, I'll keep an eye out for the DTC kit at future races and say hi. I wish you all, all the best in the future with life, training and racing”. 4. Consensus that the water feels “faster” now at Nightcliff Pool. 5. Racing M Dot Ironman or 70.3? List your club/team as Darwin Triathlon Club as 2015 kicks off new IM club point scores. 6. Appreciate an email heads up if you or someone you know is racing away over the Xmas/January break. 7. This is the last E News for 2014 – hope you have enjoyed receiving it and thanks to those who have given feedback during the year. Any news or announcements over the holiday season will be posted to our Facebook page and website, so check in regularly. We hope this covers most of your training and racing needs. This order of club design gear is timed for delivery end of January so we encourage you to think ahead regarding your training & racing needs. 1. Size Chart: It is very important to measure yourself and check sizes against this chart. Fit is snug so recommend you order up if you are on cusp. Q: What does the club design items look like? A: Most of you have seen members in club gear. Images of the items can also be viewed as you place your online order. Q: Who is our supplier? A: Our suppliers are Cannibal - long time Oz triathlon suppliers. Q: Can I try items on to see what size I am? Q: Is there more info on items? A: Yes. Refer Cannibal website for more detailed description of their custom range. A: We recommend you measure yourself, check the size chart and then order relevant sizing. Don't guess! Q: What if I order and it doesn't fit? A: Happy to advertise the item for re sale in the E News on your behalf. Q: If I don't order now can I get what I want later? Q: Why doesn't the club hold uniform stocks? A: A number of reasons including deterioration in our climate, storage, administration, cost to the club and the volunteer time involved. Q: Why do I have to pay up front? A: The club has to pay up front before delivery. Club gear order is a voluntary service to members & experience tells us this is the easiest way to manage. Q: If I don't order now, when will the next order be done? Q: How much profit does the club make on this? A: Zero. The club also subsidizes the freight & design costs to ensure members get quality club gear at the lowest possible cost. The cost listed includes online service fee. Q: Closing date is next Sunday 4 Jan 2015, why are you asking people to order now? A: Some people are using the opportunity to place orders as Xmas gifts for others (making up their own voucher to present on Christmas Day) and we thought this a fantastic idea. Also if enough orders are received, we can get the manufacture underway early which will facilitate early delivery. Q: What if minimum order numbers are not reached? A: If order numbers are not at or close to minimum, your payment will be refunded less online fee. Q: What is the expected time for delivery? A: If enough early orders are received we are hopeful of delivery by Aquathlon #2 otherwise end of January. You will receive an email when orders are ready including delivery options. Take advantage of this opportunity to order our quality club design gear. Lots of tri happening over the past couple of weeks with members competing around the country and overseas as well as taking part in our Christmas Splash n Dash on Saturday evening. I’m hearing the numbers were on the small side but that enthusiastic fun was had by all. Once again the combined relay appears to have left the adults gasping at the intensity! It was a shame Nightcliff Pool wasn’t available for use this year but I’m sure we will be back to our traditional location next Christmas! A big thank you to Rob Weatherald for organising this session (again) and our thanks also to all those who chipped in to help on the day. Blue Cycles NT were also present supporting our event – Thank you! 1. We are holding a free Christmas Come and Tri session for 5-12 year olds at Lake Alexander on Sunday 21 December 2014 at 7.30am. 1. Thanks for all those who gave feedback regarding club tri gear. 2. Watch for details of a new club tri gear order – hoping to get it launched this week for delivery to be in time for kick off of our new year events. 4. FOR SALE: A number of triathlon bikes are listed for sale on DARWIN TRI – BUY | SWAP | SELL Facebook page. 1. Congratulations to Kylie Gaffel and Glen Scholz on their recent marriage. In true tri style Mr & Mrs Scholz timed their wedding for post-race in Phuket. 2. General entry for Ironman WA is now open. 3. More details for the inaugural Ironman 70.3 Vietnam (10 May 2015). Entry now open. 4. Do check our updated calendar for details of our upcoming events for 2015. Some roster spots still need to be filled to ensure these events can go ahead - email if you can help out. 5. We are losing one of our top volunteers next week when Dave and Joy Glass and family move to Perth. Before they leave town, we would like to take this opportunity to again thank Dave for his contribution to our club events over the past couple of seasons and to wish them all the best for the future. We had a great turnout at Lake Alexander for our final swim, bike, run format event for 2014. Conditions were hot and steamy and the competition much the same! Our thanks to RD’s Tony Cox and Julia Logan for taking charge of the running of our event. As always their efforts and those of all our volunteers on race day are hugely appreciated by club members as is the support given by Blue Cycles NT. Do check our updated calendar for details of all our upcoming events for the remainder of season 2014|2015 as there have been extra events included in response to member feedback. Some roster spots still need to be filled to ensure these events can go ahead - email if you can help out. The final event on the seniors calendar is our traditional Christmas Splash N Dash, with Nightcliff Pool reopening just in time for this! There will be no E News next week, so please check our website, facebook page or Twitter for updates. 1. Christmas theme is optional but you will probably be the odd one out if you aren’t sporting at least some tinsel! 2. This is a combined junior & seniors event and will include our traditional relay so make sure you hold something back for that. 3. This is a fun, novelty event and won’t be officially timed or points awarded. 4. Heads up there is likely to be a gathering on the foreshore afterwards for BYO food & drinks (no glass or alcohol allowed at pool). 1. Next event for juniors is our joint Christmas Splash N Dash at Nightcliff Pool on 6 December 2014 commencing at 5:30 for 6pm. 2. This event is free but we need to know how many members are attending so please up juniors here. 3. Date claimer: The final junior activity of the year is planned for 21 December 14, with more details coming soon. 4. POST your items to buy, swap, sell or simply giveaway to a good home at DARWIN TRI – BUY | SWAP | SELL Facebook page. Request to join and feel free to add your posts & include photos if you wish. If your item sells, please comment sold on your post. 1. Congrats to Sinon Cooney & wife Bec on the arrival of their little tri baby, a son, Senan. 2. General entry for Ironman 70.3 Cairns opens tomorrow. 3. We have a number of athletes on away start lists this coming weekend including Pieter Jordaan & Michelle Gailey at Ironman 70.3 Western Sydney, Hannah Johnston at Mornington Triathlon in Victoria and Justin Tranter, Glen Scholz, Stef Puszka, Tim Green, Robyn Stanley, Joy Glass, Ali Fitch, Jo Ellis and Dave Glass at Challenge Laguna Phuket in Thailand. Good luck! 4. Also going round at the Soldier On Yungaburra Triathlon, Clinton Luxford and Jenny Kirkby, with both former members sending a big hi to those in Darwin. 5. Expressions of interest for club tri gear are invited. If enough response we will do an order soon with delivery in January. Please email here if you would be interested in a trisuit (approx. $170), tri top (approx. $65) or tri pants (approx. $65). Junior sizes available. Your suggestions for other items you might be interested in done in club colours would also be appreciated. Darwin Triathlon Club celebrates its 25th anniversary this month. Triathlon has been around the Top End far longer than that, but our club was officially incorporated on 30 November 1989. The composition of our membership can change each year due to the often transient nature of life in Darwin, but the best things about our club are the warm welcome given to our new members, the friendly nature of our events and the lasting friendships and connections made by our members that endure long after people have left the NT. It is not unusual to receive requests for uniform items from those leaving. Many want to maintain their link with our club or quite simply wear our colours because they are recognised around the country and overseas and are a great conversation starter – usually a “do you know ….”! Links remain strong and there are often reunions at far flung events or here in Darwin when former members return for a visit or to compete. We recognise all those who have contributed to the development of Darwin Triathlon Club over the past 25 years (many of whom are featured on our Honour Board) and look forward to the continuing success of our club in the years to come. To ensure we are catering to our member’s needs, the committee is reviewing all our operations, building on work commenced by previous committees. We are also listening to member feedback and our event this Sunday is an addition to our original calendar after members indicated a preference for more of this distance. Thank you to those wonderful people putting up their hand to volunteer so that this and our other events can take place. Online entry open When entering our club events please use your DAR number (not your TA number). 1. We ask that you take the time to read the basic rules of triathlon before our event on Sunday. 2. Blue Cycles NT will be on hand at our event should you need mechanical assistance & they will also be helping out. Thanks to Matt and the team for their continued support at our events. 3. Blue Cycles have come to the rescue on a number of occasions but it would be far better if they had nothing to do, so we suggest you make sure you have checked your bike, pumped up your tyres and remember your helmet on race day! 4. And don’t forget your timing chip. 2. Check items posted to buy, swap, sell or simply giveaway to a good home at DARWIN TRI – BUY | SWAP | SELL Facebook page. Join while you are there and feel free to add your posts there & include photos if you wish. 4. Items for next E News by Monday 8pm please. 1. Watch for calendar updates & added events (both senior and junior) on our website. 2. Watch for our new Junior Facebook page being set up by our junior committee. 3. Good news! We have had confirmation that Nightcliff Pool will be reopened in time for our combined junior/senior Christmas Splash N Dash (6 Dec). The committee last night decided the event would be a free, fun, novelty participation event. It won’t be timed and no points will be awarded. More details to come. 4. Watch for an update on all things event related which will be going out to members in the near future. The weather gods were kind for our Splash N Dash and the junior event at the Waterfront on Saturday evening. The location is a picture perfect event backdrop and we gained a lot of interest from those on the sidelines and from the various establishments. A big thank you to our volunteer Race Director Brian Gallagher for his efforts in putting this event on for us. Also a big thank you to our roster volunteers, the team from Blue Cycles NT and those of you who stepped up on the evening to help out. As always, we acknowledge our events are only possible because of our brilliant volunteers. 1. More good news regarding events with confirmation that our additional triathlon on Sunday 23 November 14 will go ahead at Lake Alex. 2. You asked for it! The distance: 300m swim, 13km bike, 3km run. 3. HELP NEEDED - We have listed president Tony Cox as RD for the event on the 23rd, but now appeal for someone to step up and volunteer to co-pilot this event with him (he could then take part). Tony does all our sanctioning, permits etc for every event as well as helping out at the majority. Please email if you are available to assist Tony with the RD position or can help out with marshalling. 1. When entering our club events please use your DAR number (not your TA number). 2. As you also need your timing chip number for entry, why not write it on your m’ship card and have all your info in the one place. 1. 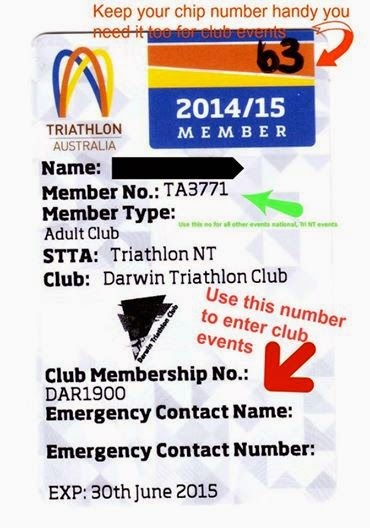 Do you have an interstate Triathlon Australia membership and now wish to join Darwin Triathlon Club? 2. Or are you leaving / have left Darwin and wish to join another club? 3. TA give this information about joining multiple clubs: "It is possible to join multiple clubs via our membership system. In order to do this, you need to first of all complete your membership to TA, your State and your first club option. Then you will need to go back into the membership system as though you are registering for a second time. Use the same email address and password to log in. The system will recognise that you already have paid for annual membership to TA so it will show as ‘$0’ cost and you will not be charged for this again. You can then choose the relevant State and second club from the drop down lists. This time it will show up with a cost for the second club’s annual membership. When you go through to the check out page you will only be charged for the cost of membership to the second club. You will then be a member of both clubs." 3. Check items posted to buy, swap, sell or simply giveaway to a good home at DARWIN TRI – BUY | SWAP | SELL Facebook page. Join while you are there and feel free to add your posts there & include photos if you wish. 1. The speedy guys were in action at IM 70.3 Mandurah Pro Championship with Raelert coming close to breaking his world record time with his 3:35:55. Former members who were also speedy included Derek Cross who was first age grouper (again) in 4:02:55 (1st M35-39), Ashan Weerakkody 4:18:09 (3rd M25-29) and Barry Silverlock 4:46:56 (1st M55-59). 2. Have you moved up or down in our Pointscore since the latest update? Check it here. 3. Rumours say that there was an encounter with one of the resident queenfish on Saturday. 4. We had some lost property left after the race. It is always a good idea to check you have picked up all your gear before leaving. 5. On the start list for Challenge Shepparton – Michelle Gailey. Good luck! 6. Heading south to race in the inaugural IM 70.3 Ballarat – Tim Wolf. Good luck! 7. Did you get in to Noosa 2015 before TA priority allocation sold out? 8. Former club president Paul Bell is in town for work & came down to the Waterfront for a catch up. 9. Tri legend Belinda Granger races her farewell event on Australian soil at Challenge Shepparton this weekend. BG has been given the No 1 bib. 10. With many on the move at this time of year, those members leaving Darwin are encouraged to return their timing chip so it can be put back into circulation. The wet has officially arrived and I’m guessing some of you even dragged out the old bike this morning for puddle dodging. In the wet season spirit we kick off our annual aquathlon series with race #1 on Saturday evening - Splash N Dash - at the popular Waterfront location. Entry is not closing until 8pm on Friday but to assist organising volunteers why not get your entry in here now. Don’t worry, tri season is not yet over for 2014 as we have also added in an extra event - a 300m swim/13km bike/3km run format at Lake Alexander on the 23rd Nov. There are still volunteers required for this and also some of our other events so we again encourage you to have a look at the calendar and email if you can fill a vacant spot. 1. Torso must be covered during the run leg. 2. Being at the Waterfront this event puts us in the public eye more than usual and we ask your assistance in making sure we leave the area rubbish free. The juniors will also be having an event on at the Waterfront this Saturday. The event will be open to all juniors. The course length will be determined by who turns up on the day. Junior members register and pay ($3) on the day. 1. FOR SALE: Fuji D6 Pro Frame and Shimano 105 groupset. Frame is about 4 years old, group set is near new upgraded frame so this one needs to go. $1500 for both, great for a first time TT. 3. To assist our triathlon community to get the word (and photos) out regarding personal triathlon related items they may wish to buy, swap, sell or simply giveaway to a good home, Robyn has set up a Facebook group DARWIN TRI – BUY | SWAP | SELL initially on a trial basis. Feel free to add your posts there & include photos if you wish. 1. Names in the Noosa results with DTC connections included: Oliver Cook 9th M25-29 2:09:40; Trent Jensen 55th M35-39 2:19:24; Leigh Milne 191st M35-39 2:34:34; Clinton Luxford 24th ADF 2:41:18; Clint Doolan 104th M30-34 2:21:30; Bertram Birk 48th M55-59 2:45:13; Chloe Kay 53rd F25-29 2:51:52; Cath Meng 47th F50-54 3:21:04. Many took the time to catch up. 2. On a sad note, the triathlon community is in mourning following the death of Jackie Fairweather (nee Gallagher) a true champion of our sport. 3. Jackie visited Darwin in 2002 providing a weekend of junior clinics and Q & A sessions which inspired our then juniors and parents alike. 4. The national triathlon calendar is jam packed and this weekend will see members competing across the country. In WA, Emily Heames, Shellie Ratahi, Graeme Parsons and Alex Murdock will be among those lining up at IM 70.3 Mandurah; Michelle Gailey is on the start list for Challenge Forster in NSW and Stef Puszka, Sarah Collins and Tim Green are on the list for Murray Man Triathlon in SA. Good luck to all members racing at home and away. 5. Our annual pointscore is up to date. Check it here if you haven’t already done so. Please email if you believe a correction needs to be made, we appreciate your help to kept our records correct. 6. Don’t forget to give us an email heads up if you (or someone you know) are racing away. 7. As well as helping out at our events, the team at Blue Cycles NT just got a whole lot busier with the opening of a third store, this time at Palmerston.